Europeans’ cities were more built up before the car, and they didn’t then tear their cities apart to accommodate cars and facilitate sprawl, as we did. The US is so vast that we could pave everything within 200 miles of New York City and still have more than enough land for our corn and cows. But if Europeans wanted to preserve rural areas, they would have to use urban space more efficiently, and so they have. A much greater share of the typical European metro area’s population is concentrated in its inner city. So you get dense, transit-rich cities with countryside in between. When I first started writing about high-speed rail and even in that post I linked to in the second sentence of this post, I didn’t take into account the historical perspective. I did talk about land area, but the composition of that land area might be more important than the land area itself. If there isn’t the space “in the city” to put the high-speed rail, it’s going to take a yeomen’s effort and a healthy serving of political capital to create that space. The unfortunate part is, as time moves forward, the necessity (and gains!) of high-speed rail increase. The population of some of the biggest cities in the US (that would be served by better public transportation) is increasing and while I’m not sure the best way to measure it, I suspect that the business between cities (i.e. 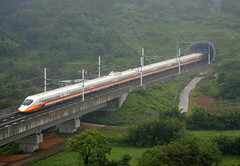 the necessity to travel between cities where high-speed rail would be beneficial) is probably increasing. So, where does that leave high-speed rail proponents, aside from considering an extended trip to Europe? That’s a great question. It seems that there’s still going to be those organizations that lobby Congress, but if I had to hazard a guess (or a forecast, if you will), I suspect that the most likely way for there to be an improvement in high-speed rail in the US is some sort of catalyzing event. You might even call it a tipping point. One such way could be an increase in the cost of oil (i.e. jet fuel), skyrocketing the price of flying and forcing people to consider other modes of transportation from Chicago to New York. It might also be that a presidential candidate takes up the issue of public transportation and rides it as their “thing” to the White House (and then implements the plan within the first 100 days of office). Both of those scenarios aren’t very likely, but this pie-in-the-sky thinking is where high-speed rail proponents find themselves. This entry was posted in Technology and tagged California, Car, Europe, Germany, High Speed Rail, North America, Public transport, Public Transportation, Train, transportation, Vox. Bookmark the permalink.